The "Feed" screen is for viewing and recording the consumption of animal feed. The feed usage may be used to track an animal type or it can be for an individual animal. This is not where feed expense is recorded. Feed expense is recorded in the "Financial - Expenses" entry area. Normally, this will be used to record feed usage per animal type when using bulk or custom ground feeds among several different types of animals. Entries can be recorded daily, but it is much easier to record the total usage weekly, bi-weekly or monthly. The recommended method is to record usage in the system on the 15th and last day of each month by totaling the feed usage charts located at or near the feed bins. Placing weight marks on feed containers, by weighing them and then adding feed in 1 pound increments, is an easy method of measuring the feed by weight. After the marks are placed on the container there is no need to re-weigh at each feeding unless feed brands or mixes are changed. Feed Date (Required entry) Select the date the feed is used. Description (Recommended entry) Enter descriptions such as custom blend, or the mix recipe name, etc... The maximum length of this field is 60 characters. Type of Feed (Required entry) Select the type of feed: Feed, Mixed Feed, Hay & Forage, Supplements, Other. 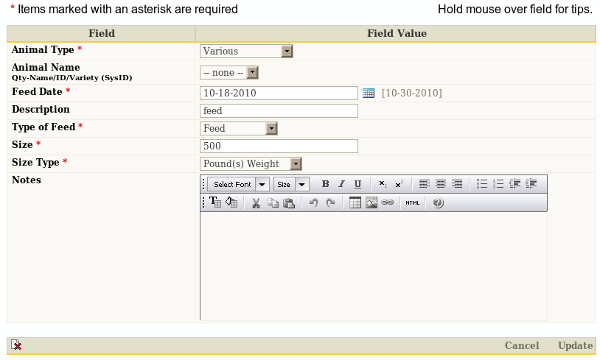 Size (Required entry) Enter the size of the type specified in then "Size Type" field. In the example (above) 500 pounds are entered. Size Type (Required entry) Select the size type of measurement.